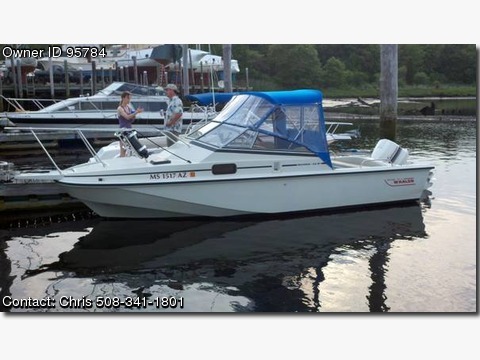 Contact the owner Chris @ 508-341-1801.1985 Boston Whaler Revenge 22 WT (Walkthrough) all original. I am the 3rd owner of this boat. Very clean, runs great, recent maintenance performed @ Licensed Evenrude dealer. This boat was a Maine Lake boat for 95% of its life. All teak is there and in great shape. Bimini and cover is 2 years old. Have a 2 year old Navigloo winter cover for the boat also. 1984 Load Rite trailer that has 4 new tires, new bearings and rewired is part of the deal. I hate to sell it, it is an amazing vessel. New Lowrance Elite 500, ship to shore radio, all lines, bumpers are new, chrome is in great shape. Boat is in the water currently for a sea trial if anyone has legitimate interest in owning a classic Boston Whaler.